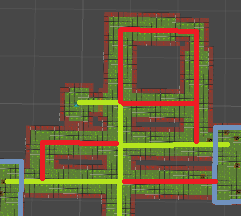 Now, I’ve designed my dungeon steps well enough that I am not getting a big score variation between iterations. That is, I’m never seeing some crazy -1000 score dungeons where everything failed. Mostly it’s just “almost as expected plus bonus”. So I need additional rules for scoring, because currently I’m only scoring hand-designed rules that have “success” built into them (especially the pattern clean-up), but no inherent “visual nice-ness” that I can directly score. So what I really want is to run the dungeon many, many times and see what sort of scenarios I want to avoid (or encourage). Then encode these into the scoring. So I’m just going to find a bunch of examples now and then write algorithms in a separate layout analysis pass. This is also surprisingly quick. 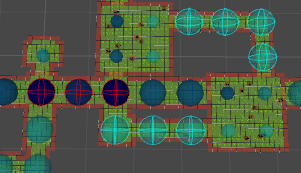 Going from 1 to 30 iterations raises the time taken from 300 to some 550 ms and most of it is creating Unity scene stuff. So I have free time I can “spend” on this. Now, my generation steps are fairly normalized and I actually don’t see these any big score variations between iterations. Most maps look fine as is. 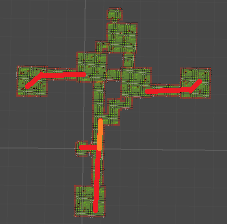 However, it does mean that I can now loosen up the generation step logic and let it create “crazier” dungeons. Then I can simply discard the bad ones. The hope is that the final chosen dungeon is randomly better. In other words, instead of generating average dungeons, I generate both bad and good dungeons, expect I can also choose what is “good”. Occasional weird tunnels is okay, but this one is just tunnels for tunnels’ sake. I think I can apply similar logic to checking arena entrances. 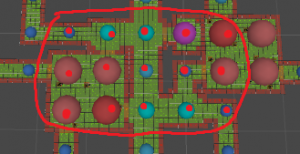 The areas formed by the connected tunnels must have a minimum amount of connections to (unique) arenas, otherwise they are just pointless labyrinths. 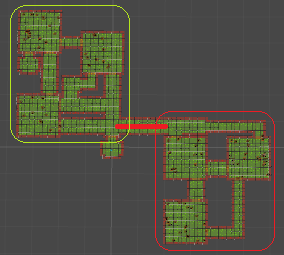 I thought this would make dungeons where the player can reach everything too quickly undesirable implying either bunched-up or too spread-out layout. But it turned out that I never even saw these issues and penalties. And the dungeon feels fine even with pretty extreme variations. Basically, it is local small things that catch your eye and not big global things. So I scraped this and will focus on small weird things instead. And as far as I can tell from my observations, these seem to pop up much less now. 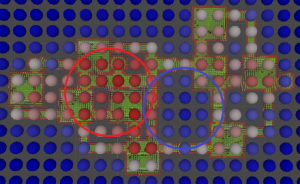 In a more generic formulation of the issue is that I would like a way to detect “hot” nodes that “connect too much stuff”, even when they are not as an extreme case as above. Unfortunately, I cannot run a perfect algorithm (in that it always find the correct answer), because that would be way too slow. 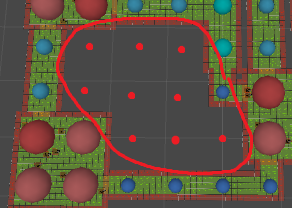 I cannot flood fill from every node to see if it cuts off some section of a dungeon. 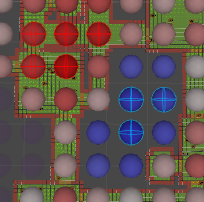 I cannot find paths between every node. Basically, I need a heuristic algorithm. It’s a bunch of work to set these up, of course. 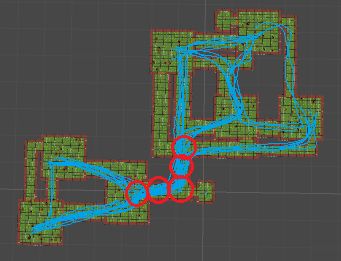 But these have helped me immensely in debugging issues and just quickly seeing whatever I am trying to examine, especially when the underlying data is not something that directly translates into in-game things, like deleted nodes or content spots or whatever. Without being able to visualize things like this, it would take me way longer to adjust certain things. With these I can just click refresh over and over and instantly see the result. 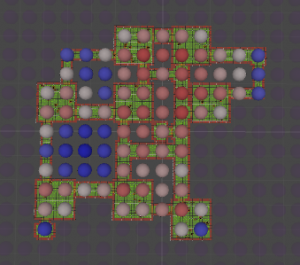 Yay for pretty debug! I’m sure I can think of many other (overly complex) ways to score my dungeon. But I think this is sufficient for immediate means. Majority of my generated dungeon look very decent. Rarely are there strange layouts. 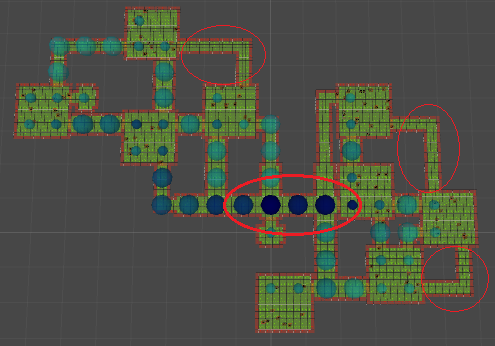 I can generate dungeons for ages and not see anything that strikes me as anything but “well, this is slightly off”. And I’ve already spent a lot of time on this, so I need to go back to some more gameplay.